There are hundreds of online casinos sites online. How do you decide that the Spin Palace Casino is the casino venue that’s right for your gaming preferences, interests and budget? Veteran gamers know that it’s important to take a few minutes to read casino reviews before they open an account. The reviews provide the basic information on a casino’s games, platforms, promotions, ebanking options and customer service. This review aims to help you identify whether Spin Palace is the casino that best meets your gaming needs so that you’ll be able to enjoy a gaming adventure that gives you great gameplay with top wins. Once you’ve read the review you can enter the casino in the Free Mode to play any of the games with no deposit requirements. You can play for free for as long as you wish before entering the Real Mode to play for real money prizes. Spin Palace interfaces with all types of connectivity including cable and Wifi for your desktop PC or on roaming data for mobile casino gaming pursuits. You also have the choice of playing on downloaded casino software at the Download Casino on your gaming console or opening the casino URL to play at the site on your mobile or PC browser. Spin Palace has all of the traditional table and card games so you can enjoy a classic casino adventure as you compete at roulette, baccarat, craps, poker or blackjack. You also have a wide range of additional variations of these old favorites to give you a gaming experience that fits your particular gambling and betting levels. Many people come to Spin Palace because of the wide variety of casino slots in the slots lobby. Spin Palace features both the old-time three-reel classic slot machines for gamers who are looking for a more slow-paced gaming event and the five-reel video slots for players who wish to enjoy a high-energy, dynamic adventure with multiple paylines and interactive features such as respins, wild symbols, scatter payouts, retriggering free spins, cascading symbols and more. Microgaming is known for perfecting the progressive slot machines. These are highly collaborative games that link slot machines together so that all participating machines participating in the race to win a big jackpot prize. In a progressive jackpot each player contributes to the jackpot as part of the regular game and continues to play the game as usual. Throughout the game the player keeps an eye on the progressive jackpot meter because if one of his spins trips the machine, he will win the entire prize. Some of Spin Palace’s most popular slots include the Kings of Cash fantasy game, the high-stakes Golden Princess Aztec-themed slot machine and wildlife-themed games such as Untamed: Bengal Tiger, Untamed Giant Panda and Untamed: Crowned Eagle. There are humor-filled slots, slots that feature animals and sports and much more. The best way to maximize the Spin Palace payouts is to take advantage of the casino’s bonus programs. The bonuses are applicable to all the games (excluding the Free Spins which is slots-specific). You can even use multiple bonuses simultaneously so you collect multiple payouts on each game’s wins. 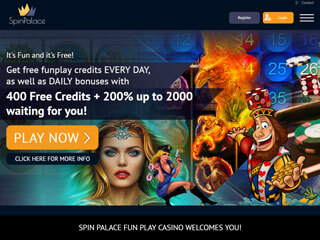 The Spin Palace Welcome Bonus matches your deposits on your first 3 real money games. This new player bonus matches your first deposit up to $250 with a 100% match bonus. There’s a 25% match on your second deposit that’s valued at up to to $300 plus a 50% match deposit, valued at up to $450 on your third deposit. The new player bonus works like this: on each of your first three deposits during your first week of gambling activities the casino delivers added credits. You can apply these match credits to any of your favourite games with the wins that are achieved on these match points being added to your regular game payouts. There are other promotional give-aways that you can add to your Welcome bonus during your first week of gaming and take with you as you continue at the casino. The games are powered by the Microgaming games developer. Microgaming is a licensed game developer which is monitored by international gaming agencies to ensure that Microgaming players have access to the safest games with the highest level of security. Microgaming games are secured by highly advanced firewalls and 128-encryption codes to ensure that players enjoy the highest possible level of security. 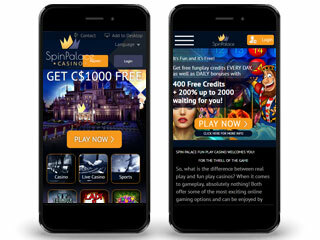 Spin Palace maintains a policy of complete privacy for its gamers to ensure that their personal details will remain private and secure. Gamers can contact the Spin Palace customer service 24/7 by instant chat. Click on the “Contact” button at the Spin Palace website’s upper right-hand side to open the chat window. Spin Palace Casino offers gamers around the world to enjoy genuine casino entertainment on their PC or mobile gaming device.